Redda Mehari of the African Community Center as seen in September 2018. Mehari fears that a drop in the number of refugees to the U.S. could mean the closure of the organization he runs to help them resettle. Photo by Yazmin Beltran. Redda Merahi remembers walking for two weeks from his native Ethiopia to reach Sudan, and then waiting two years to be processed before he arrived in the U.S. as a refugee in 1983. He now serves as director of the Ethiopian Community Development Council (ECDC)’s African Community Center, a refugee resettlement organization in Las Vegas that serves not only people from Africa but those from all around the world. But the country could be seeing fewer people like Merahi going forward. President Donald Trump’s administration announced last month that it will reduce the number of refugees who may enter the U.S. in the new fiscal year to 30,000, a drop from the 45,000 admissions allowed each year and the lowest cap since the program was established in 1980. Pompeo said applicants must continue to be investigated responsibly to keep out those who might harm the country. He added that the cut in refugee admissions should be viewed in the context of the U.S. providing foreign aid and allowing hundreds of thousands of people already in the country to seek asylum. “These expansion figures continue the long history of the United States as the most generous nation in the world with respect to immigration based on protection purposes,” Pompeo said. But critics say the move to reduce the cap on refugees because of a growing number of asylum seekers is pitting the two groups in dire straits against each other. And Merahi is concerned the reduction could mean mean the possible closure of organizations like ECDC. The United States Citizenship and Immigration Services (USCIS) defines refugees as those out of their native countries and unable or unwilling to return because of a well-founded fear of persecution related to race, religion, nationality, belonging to a particular social group or having a political opinion. That’s different from an asylum-seeker, who may have the same fear of returning to their country but who is actually in the United States while pursuing a claim to residency. Many of the Central American families who have turned themselves at ports of entry along the border in recent months are living in the U.S. while their asylum cases work their way through the courts. Pompeo said that beyond the reduced quota of admitted refugees, the government expects more than 280,000 people will seek asylum in the coming year. Those are in addition to the more than 800,000 asylum seekers who are already in the United States and expect a response to their application. 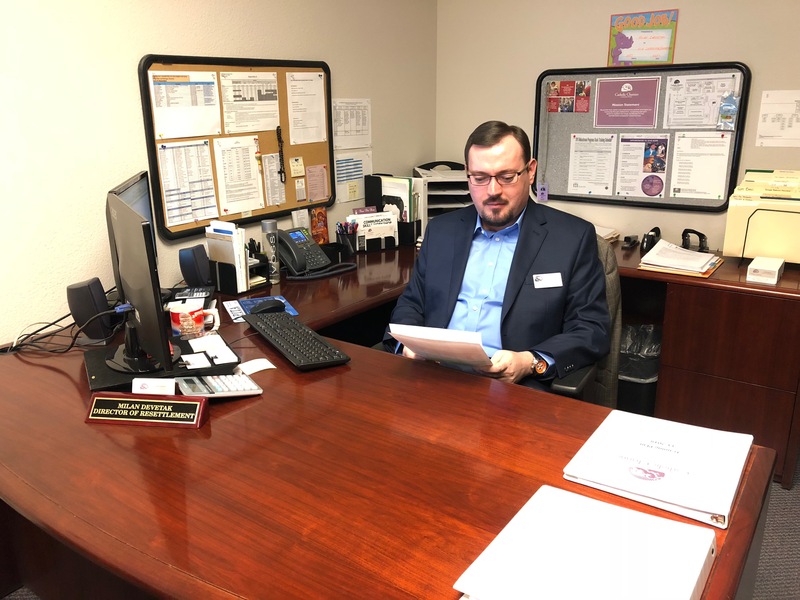 Milan Devetak, director of resettlement at Catholic Charities of Southern Nevada, as seen in his office in September 2018. Photo by Yazmin Beltran. Representatives of Catholic Charities of Southern Nevada indicated that it can take several years before the applications of prospective refugees to the United States are approved. For a person to be considered a refugee, he or she must have left their country of origin. The UNHCR estimated at the end of 2017 that some 68.5 million people were forcibly displaced worldwide because of violence, conflict and persecution. That year the UNHCR also estimated that in the world there were some 25.4 million refugees, with 68 percent coming from Somalia, the Syrian Arab Republic, Afghanistan, South Sudan and Myanmar. Among asylum countries with the largest number of refugees is Turkey with 3.5 million, mostly Syrians. Turkey is regarded as having the highest number of refugees in the world, while Pakistan and Uganda have 1.4 million. Lebanon ranks fourth, with almost 1 million refugees, Iran ranks fifth, and Germany is sixth, with some 980,000 refugees. Catholic Charities of Southern Nevada has assisted fewer refugees since Trump took office. In 2016, the organization helped with the resettlement of 3,068 people. That figure decreased to 1,806 in the 2017 fiscal year and fell to 623 so far in 2018. Most of them come from Cuba, Congo and Afghanistan. The work Catholic Charities does begins as soon as refugees arrive in Las Vegas. The organization becomes the first point of contact by picking them up at the airport, taking them to a furnished apartment, and providing food, clothing, medical care and access to education. These services are offered through a federal grant called Reception and Placement, which is administered by the State Department’s Population, Refugees and Migration Bureau (PRM) and aims to provide basic resettlement services for newly arrived refugees. The adaptation and settlement process continues when refugees are assigned a case manager to help them integrate successfully in the new environment, including providing classes on how to get a job. Although the purpose of these organizations is to help them thrive in the United States and make them self-sufficient, Mehari said the transition can be difficult. “Many refugees spend years in these refugee camps. We took care of children who were born and raised in these camps,” Mehari said. “They came here as 15 and 16 year old teens and they had never seen a school, they did not know what a school was,” the director of the center said. One of the beneficiaries of Catholic Charities’ refugee work is Sorat, who came to the US in April of 2015. Just weeks after arriving in his new home, he had managed to get his driver’s license, which helped him find a job as a taxi driver. Sorat worked to assist U.S. troops while a war raged in his native Afghanistan, and later came to the U.S. as a refugee and resettled in Las Vegas. Sorat is part of the Afghan Allies Protection Act of 2009, which authorizes the issuance of special immigrant visas (SIVs) to citizens of that country who meet certain requirements and who were employed in Afghanistan by or on behalf of the government of the United States in that country. The Bureau of Consular Affairs of the State Department indicates that particular visa requires applicants to have been employed for at least two years, between October 7, 2001 and December 31, 2010. 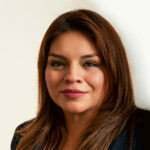 Applicants must also have experienced or be experiencing a serious threat as a result of their employment. Some things the Las Vegas resident enjoys the most is being part of the community and not being afraid to leave his house.